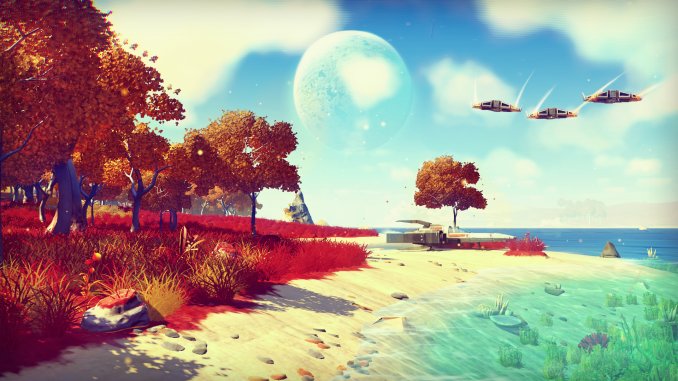 No Man’s Sky‘s gameplay is built on four pillars — exploration, survival, combat and trading. Players are free to perform within the entirety of a procedurally generated deterministic open universe, which includes over 18 quintillion (1.8×1019) planets,[a] many with their own sets of flora and fauna. By exploring, players gain information about the planets that they can submit to the Atlas, a universal database that can be shared with other players of the game. Players get compensated in in-game currency every time new information is uploaded to The Atlas. Players also gain materials and blueprints to upgrade their character’s equipment and purchase a variety of starships, allowing them to travel deeper into the center of the galaxy, survive on planets with hostile environments, interact in friendly or hostile manners to computer-controlled space-faring factions, or trade with other ships. Some activities, such as killing too many lifeforms or draining too many resources from planets, will draw the attention of patrolling robotic Sentinels that will attempt to kill the player-character. Players participate in a shared universe, with the ability to exchange planet coordinates with friends, though the game is also fully playable offline; this is enabled by the procedural generation system that assures players find the same planet with the same features, lifeforms, and other aspects once given the planet coordinates, requiring no further data to be stored or retrieved from game servers. Nearly all elements of the game are procedurally generated, including star systems, planets and their ecosystems, flora, fauna and their behavioral patterns, artificial structures, and alien factions and their spacecraft. The game’s engine employs several deterministic algorithms such as parameterised mathematical equations that can mimic a wide range of geometry and structure found in nature. Art elements created by human artists are used and altered as well within these generation systems. The game’s audio, including ambient sounds and its underlying soundtrack, also use procedural generation methods from base samples created by Paul Weir and the musical group 65daysofstatic.